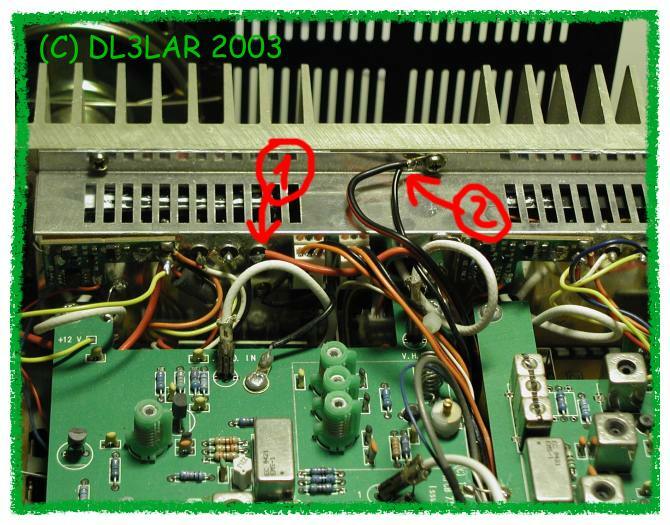 This documentation describes how to connect a low-noise converter for OSCAR (AO-40) S-Band receiption to a Yaesu FT-736R transceiver. Connection can be done in several ways, my proposal focusses on a solution with less external parts by using most of the FT-736R infrastructure. First I started with taking an overview about the known information that could be claimed from the manuals. The problem can be divided into two independent parts: first, a power supply connection for the LNC and secondly a switch for receiving both, 13cm and 2m band with my rig. When in receive mode, a limited current can supply your preamp through the coax feedline. Be careful, your preamp or your LNC must support feedline supply. You only have to install a band specific jumper to activate a preamp supply for a certain band. In my case, I bought a DB6NT 13cm LNC (MKU 24 TM OSCAR) with 144 MHz IF band - so I had to install the jumper J5018 for 144 MHz. The LNC supports feedline supply . The second problem can be solved by using a koax relay so one has two inputs on the 2m port. Using the internal preamp power supply has another advantage: it's not necessary to use a second switch for the relay, because it can be supplied by preamp power. So the preamp switch on the front side became new functionality, it switches between 2m and 13cm band. 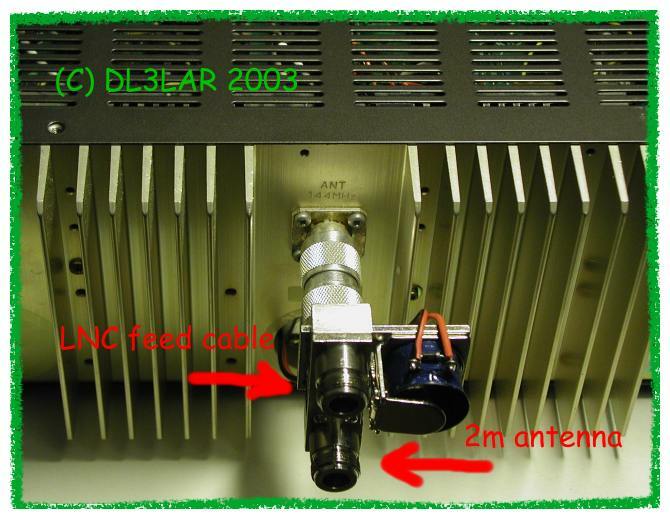 The "NO" normal open port has to be connected to the 2m antenna, the "NC" normal close port to the 13cm LNC feed line. The relay supply lines have to be connected to Preamp Supply (1) and GND (2), see picture below. Do not forget to connect a diode against transient voltage to the relay, otherwise your transceiver can be damaged ! 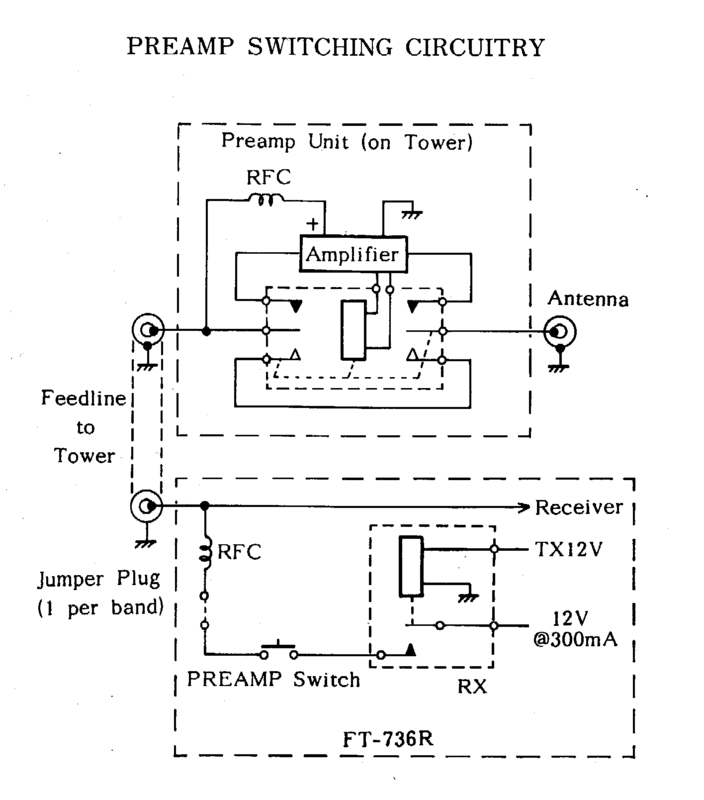 With this modification it's also impossible to send backward into your LNC because if 2m amplifier is on, preamp supply diconnects itself and the relay connects the 2m antenna and amplifier.